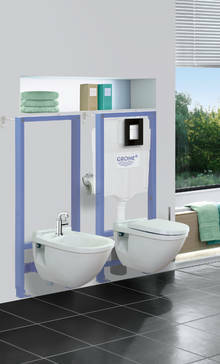 Creating a cohesive bathroom scheme is easy with GROHE. Unique design in every detail of a bathroom. 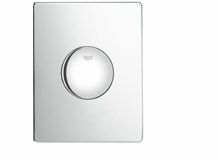 Our flush actuation plates for toilets and urinals are available in an array of designs and feature the same GROHE StarLight® chrome finish and design details as our bathroom faucet collections. 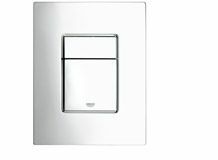 All plates can be mounted horizontally or vertically. For modern bathroom spaces, our Skate Cosmopolitan frames come in a choice of plain and printed glass, while six natural wood finishes blend perfectly with the latest bathroom furniture styles. For added impact chose a printed plate from our Nova Cosmopolitan collection. 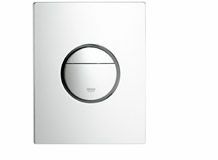 One of the easiest ways to save water in the home is to install a GROHE cistern and dual flush actuation plate. Thanks to GROHE EcoJoy™ technology, our sanitary systems enable you to significantly reduce your annual water consumption, by simply select the appropriate volume of water each time you flush. Cisterns are supplied ex-factory for dual flushing with 6 liters (large flush) and 3 liters (small flush). Flush volumes can be adapted on-site (with or without accessory sets) to ensures compatibility with all ceramics and plumbing requirements. 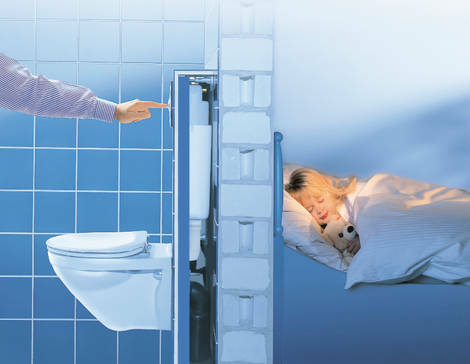 Single flush, start/stop flushing and remote actuation are also possible. For all-round comfort, GROHE installation systems are hard to beat. GROHE Whisper® technology ensures maximum design freedom when planning a bathroom. Decoupled pipe supports prevent sound transfer to the structure of the building when water is released from the concealed cistern into the WC bowl. This makes them the perfect choice for en-suite bathrooms. All of our concealed cisterns feature a built-in overflow. Should a problem arise, water will run into the toilet bowl, not on the floor. GROHE SpareFlush enables you to increase the standard volume of 6 liters to 9 liters, if required. This ensures compatibility with all bathroom ceramics and any site-specific plumbing requirements. To ensure maximum user comfort, toilet flushing can also be activated via our Air Button which can be located up to 1.5m from the cistern. 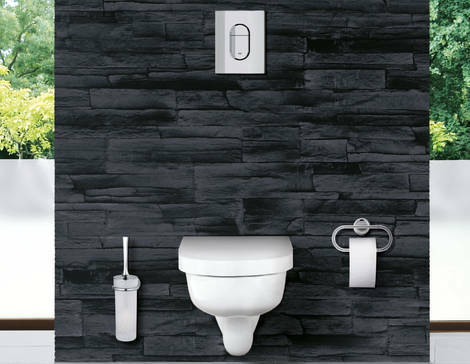 Our Rapid SL installation frames for wall-hung sanitaryware are available in a number of heights to facilitate the creation of exciting bathroom layouts. Frames are designed for use in-the-wall or in front of the wall and come in a choice of three heights: 1.13m, 1m and 0.82m. As the trend for creating 'living' bathrooms continues, zoning wet, dry and relaxation areas becomes increasingly important. Our sanitary frames enable you to create mid- and full-height partition walls to which you can safely and securely fix wall-hung basins, bidets and toilets. Concealed cisterns designed for the installation of back-to-wall toilets in combination with bathroom furniture, are also available. GROHE EasyConnect is a simple plug-in solution. A pneumatic hose connects the flush valve to the flush plate to accommodate all tile thicknesses. GROHE VarioPort offers a choice of four points to connect the water supply to the cistern: top, bottom, left and right. 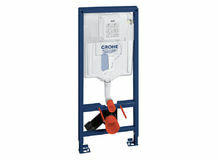 GROHE ToolFree – no tools are required to connect the mains water supply to the cistern. For fast installation, our installation frames feature GROHE QuickFix™. In a comparative test commissioned by GROHE and supervised by REFA, our sanitary installation frames were the fastest to install.